Marky and Dee Dee decide to throw a big party on Joey's birthday, but end up worsening things, which angers Oggy and Jack. Oggy believes that his relatives will be driven away by the cockroaches, so he acts timid and ignores the roaches. Jack sets up a barbecue shop to earn money from the spectators of a bicycle race, only to get distracted by Bob and the roaches. Oggy and Jack decide to take a hike but the roaches sabotage Oggy's compass and the two cats get lost in the wild. As the snowstorm hits the neighbourhood, the local residents take refuge by digging holes while the roaches hide in a snowman and trouble Oggy. Finally, as Bob moves into his new house, he turns Oggy's yard into a garbage dump which angers Oggy. Oggy's shadow breaks free from his body after the roaches trap it in order to steal food after which Oggy tries his best to retain his shadow. After doing so, Oggy participates in a fashion show as Bob and the roaches try their best to make him fail. And finally, Oggy brings a parrot home as a pet only to be frustrated by it as Dee Dee desperately tries his best to get its feathers to obtain food. The roaches find a pencil with magical qualities and Joey hatches a plan for the roaches to use it against Oggy as this seems like their best opportunity to get the better of him. Oggy and Joey fall into a pit which almost leads to the centre of the earth as they come across mystical things while getting out. And later, Oggy finds a cube which soon causes him trouble as he tries to get rid of it. Oggy attempts to express his feelings to Olivia and woo her only for the roaches to make it difficult for him. Later when Oggy, Jack and Bob use the same comb, their lives become hell when they discover lice on their head as Olivia along with the roaches them get rid of it. And finaly Joey falls in love with with a helicopter mistaking it to be a dragonfly as Oggy has a hard time controlling it. It's winter, and Oggy and Olivia plan to go ice-skating but the cockroaches bother Oggy till they freeze themselves and Oggy and Olivia go indoors. Oggy is lonely and plans to get a roommate, but he finds out that his roommates were the cockroaches. Now, the cockroaches plan to steal food but instead launch the house to outer space towards the sun until Jack comes to their rescue. The roaches create a product that makes everything soft and limp and destroy the entire neighbourhood. Soon Oggy creates another product which fixes it. Oggy, Jack and Bob decide to install a sauna in the house but the conniving roaches sabotage their plans. Oggy is hired as a cook in a restaurant and when Olivia arrives as the only customer, the roaches start making a mess in the kitchen. Oggy turns invisible after drinking an accidental mixture, then he has his share of fun until he returns to normal again. Now Oggy gets his things stolen until Dee-Dee finds out the culprits and brings Oggy's things back home. Oggy finds an easter egg in his lawn and plans to gift it to Olivia but at the end, the true owner of the egg claims it and Oggy turns the roaches into easter eggs. The cockroaches have targeted Oggy's fancy devices as prey this time, and there are no stones unturned. From messing with his new found love of solar panels to tampering with the lights so they can steal food, the pests have taken the trouble a notch higher. They also attempt to ruin his new job as a tram driver by messing the circuits of the device. 18. What A Lousy Day! A freak accident turns Oggy and Joey into a real cat and cockroach. When the others find out, they help them get back to normal. And on a boring day, Oggy and his neighbours plan to have a bathtub race but things don't go as planned when the cockroaches join them. 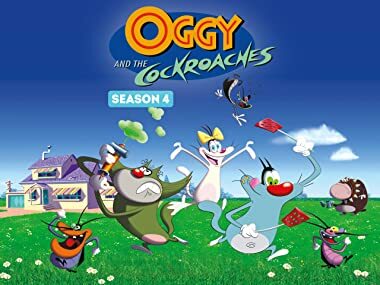 The Cockroaches destroy Oggy's television and now they are being made to participate in sports activities. An actual monster comes into Oggy's home on Halloween, and he and Jack assume that it is the other in the monster costume. Next, Jack opens up a motor garage and leaves all the work to Oggy. While Oggy does his best as a mechanic, the roaches are doing everything they can to annoy him. Finally, Oggy decides to become a taxi driver but the roaches keep trying to sabotage his taxi and annoy him. Oggy goes to a magic shop and buys a set of joke teeth, but when he puts them on, he gets super powers that let him stand up to the roaches and even to Bob. Next, Oggy and Olivia are on a romantic camping trip but Bob interupts them. Oggy and the roaches team up to get rid of Bob. Finally, Oggy's new pet butterfly and Marky, dressed as a butterfly by Bob, compete to see who is a better butterfly. When Oggy goes over to Olivia's to have tea, the roaches follow him to cause trouble. But they find a female cockroach there as well. Next, Jack and Oggy open up a hair salon. With Bob as their first customer, the roaches try to get them into trouble by playing pranks on Bob and framing the cats. Finally, Oggy and Dee Dee get lost on their way back home which worries Jack, Olivia and the roaches. Oggy decides to make some pastry but trouble finds its way when Dee Dee decides to steal the flour, there is a battle resulting in the flour turning into a flour man. Watch how Oggy befriends this strange being. Later Oggy and Olivia go on a cruise on a ship, soon the cockroaches arrive, all for the worse. Later watch Oggy take in a strange five-legged sheep which he uses to mow his lawn. The cockroaches are visited by a Mexican cockroach, soon he and Lady K fall in love, leaving Joey jealous. Watch Joey as he plans to get rid of him. Later Oggy and his pals head to the amusement park but soon the cockroaches decide to cause turmoil. Oggy then plans to buy caviar to impress Olivia but only has the money to buy one fish egg. Watch as the cockroaches soon go after the fish itself. 26. Caviar On The House! A witch's hat lands in Oggy's yard and the roaches tear it apart. When the Witch returns she mistakes Oggy and his buddies guilty and puts a spell on them after which Olivia tries to reverse the spell. Oggy finds a skateboard in the street and After a disastrous start, he begins to enjoy it but unfortunately the roaches come up with a new evil plan to destroy Oggy's passion towards his new hobby. Oggy wants to propose his love to Olivia in Venice. But he assumes Olivia is cheating on him when he finds her talking to another guy. Meanwhile, all hell breaks lose when the cockroaches plan to steal the engagement ring for Lady K. Oggy offers refuge to a homeless Dodo bird, but Dee Dee decides to make it into a meal. Oggy protects the bird and finally makes it fly off. Dee Dee goes on a diet after he realises that he has gained weight. Oggy, Olivia and Jack are on a picnic, but unfortunately their picnic gets ruined when the cockroaches and the ants steal their food. Dee Dee and Marky are trapped while trying to use Oggy's teleport machine to rob the fridge. Jack and Bob end up getting stuck together after trying to teleport. Oggy has to get them free now. At Jack's birthday party, the roaches blow up balloons with helium and tie them to the ceiling, causing the house to float in the sky. Oggy is stuck inside and doesn't know what to do. Jack persuades Oggy into becoming a wrestler. Dee Dee then helps him beat XXL and win the belt. Olivia is shocked to see a pimple on her forehead and she locks herself in her house. What will Oggy do to help her? Oggy and Jack are working under Bob as delivery boys but the cockroaches find a way to make their every delivery special. In the next plot, while exploring underwater life, Oggy stumbles across a mermaid and Joey plans to kidnap her to make money. Later, Lady K uses the cockroaches to take over Olivia's house and put her to sleep. Only the kiss of true love can save her now. The cockroaches decide to go to the Arctic to kidnap Santa. An elf visits Oggy and his friends asking for help. Oggy and Olivia head to the Arctic in search of Santa while Jack and the elf attend to Santa's Christmas duties. Will they find Santa easing this state of panic? Later Oggy is seen having a number of nightmares in his sleep, watch Oggy as he struggles to get over his sleeping issues. Oggy and Olivia are invited by Jack for the Cricket World Cup 2012 event in Mumbai. Olivia wants to go, so Oggy reluctantly agrees. The cockroaches want to steal a diamond necklace from a celebrity who supposedly is attending the match. Oggy and Olivia are busy on a date when Joey, Marky and Dee Dee are convinced by Lady K to shoplift groceries. Now, they have to fight for their spoils of war!